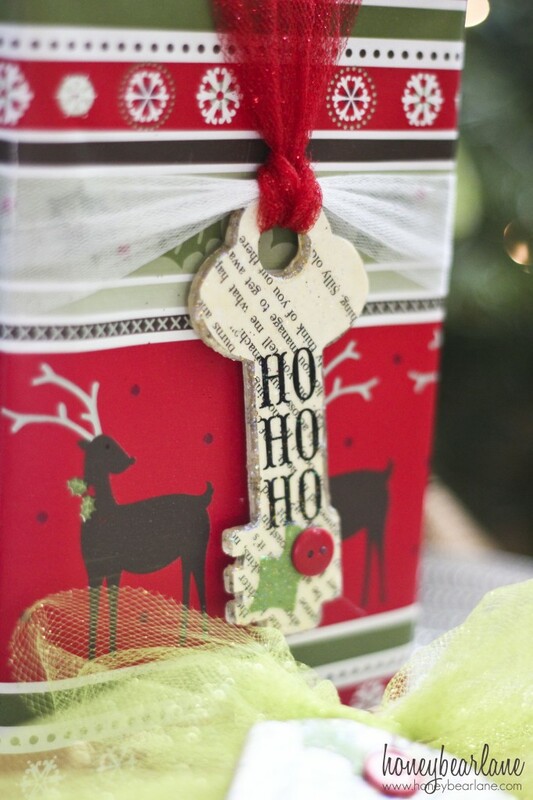 I’ve got a fun and festive project that will add a huge pop to your wrapped gifts–Mod Podge Book Page Gift Tags! 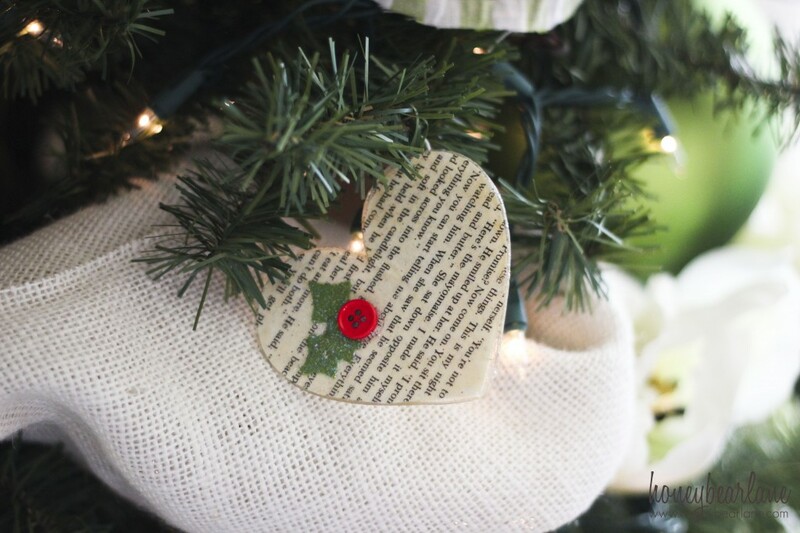 This project combines some of my favorite things–book pages, sparkle, and Mod Podge! And all the little extra details are just icing on the cake. These don’t just have to be gift tags, you can use them as ornaments too. Which is why putting them on a gift is like an extra gift–because the receiver can use it as an ornament. This is a great project that you can do with your kids too. My four-year-old did a lot of the process with me. Step 1: Trace your shape on a book page. Fold the book page in half if you want to do both sides. Step 2: Paint on the Antique Mod Podge on the podgeable shapes. Step 3: Cut out your shape from the book page and put it on the shape over the Mod Podge. Step 4: Paint the Antique Mod Podge over the top of the book page shapes. Paint a few layers to really get the antique effect. Step 5: After it dries, use a stick to rub on your transfer words. Step 6: Paint over that with Sparkle Mod Podge. Several layers for extra glitter! Step 7: To make a hanger, super glue the paperclip on the back. Step 8: Cover the the paperclip with a piece of a book page and Mod Podge over it. You can put on a thick layer and then use your fingers to guide the paper around the clip to really seal it in. Step 9: Super glue on any other embellishments. I used a red button for a holly berry and cut out some leaves from green fabric (which I also Mod Podged on. Step 10: Use a ribbon to tie it on the gift! This one was a little different–I used glitter paper and a scallop punch and a giant fat green button. It’s the cute black sheep of the family. This heart one would be PERFECT for adding a monogram onto. I didn’t do it because I wanted to use it as a gift but otherwise I totally would! So what do you think? 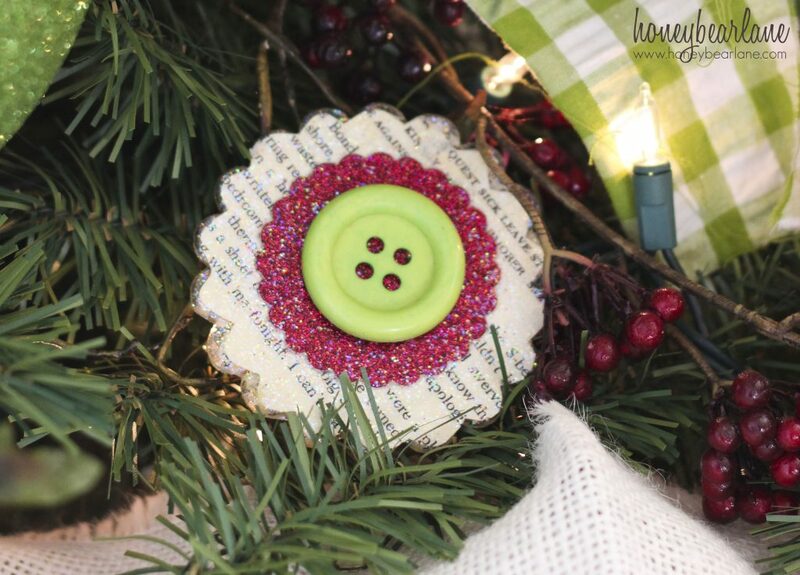 Are you using Mod Podge in your Christmas decorating/handmade gifts this year? I’m a big fan. Especially because there’s so many varieties so you can get exactly the right effect you’re looking for. 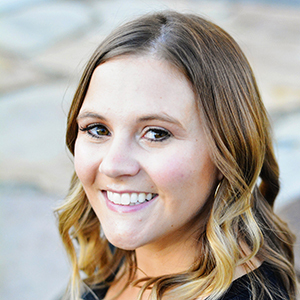 Disclosure: I am a part of the blogger network The Blueprint Social and this post is sponsored by Plaid Crafts and Mod Podge. I received compensation for this post but all opinions are 100% my own. These are super cute! 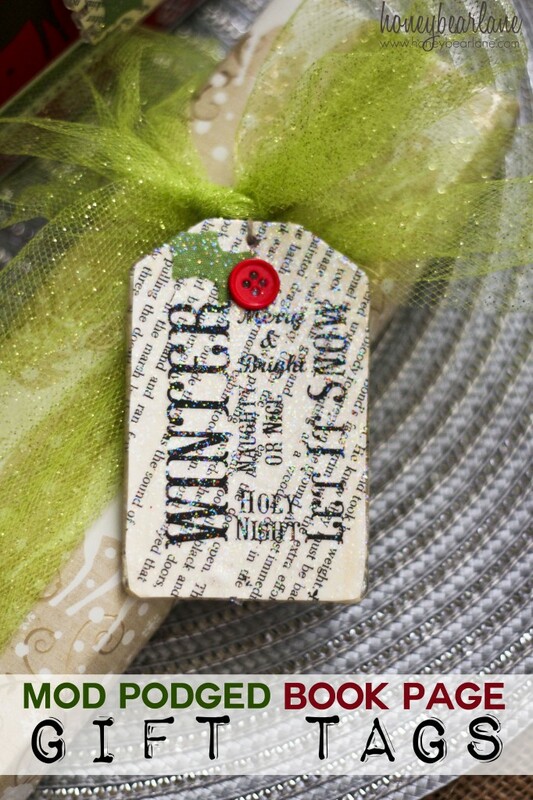 I love projects that use book pages. Thank you for the great ideas! All are spectacular– & I think they will make great Christmas ornaments & gifts!!! Can’t wait to get started! !